The Slow Cook is now located on Wordpress. We've loved our little home here at Blogger, but we will no longer be posting here. Please go to our new home. If you've arrived at this site from People magazine, you probably have an interest in starting a food garden or learning more about how to grow your own food. You may also be wondering what's behind the name "Slow Cook." I guess you could say I am part of a growing movement in this country that rejects industrialized food in favor of food that is produced more sustainably. That encompasses a lot. It means favoring foods that are grown locally without pesticides and chemical fertilizers and without traveling long distances at the expense of enormous amounts of fossil fuels and carbon emissions. It just so happens that the sustainable foods we prefer--grown in a planet-friendly manner and prepared with loving care--are also tastier and more nutritious. And if you grow them yourself, they're a whole lot cheaper as well. That makes our approach the opposite of "fast food." And that makes us slow. Food gardening can be as easy or as difficult as you want to make it. If you are just starting, I suggest you take the easy approach. Don't try to do too much at first. Don't go overboard with many different varieties of things. Stick with the fruits and vegetables your family likes to eat most and learn how to grow those. You can always add things later. Gardening is a never ending learning process, even for people who've been doing it for years. If you have children, you will be creating wonderful memories--and good eating habits--that will last a lifetime. To get you started, I've assembled links to several other web sites that I think will be helpful. At those sites, you may very well find yet more links. In today's world, gardeners spend quite a lot of time cruising around the internet for ideas and information. We also have a wonderful and vast community of fellow gardeners and cooks to share with. (Who knows? You may end up starting your own blog to memorialize your gardening efforts.) And do feel free to cruise around this website and use the search feature. If you don't have your own yard to garden in, don't despair. You can grow many things in pots even on an apartment balcony. Perhaps there is a community garden in your area, or maybe you would like to start one. Check with your local parks and recreation authority. With more and more people seeking to join community gardens there are often waiting lists. Some erstwhile gardeners are seeking out vacant lots. Others are enlisting the back yards of neighbors to form communal arrangements. And there is a growing movement to establish gardens in schools, where we can connect kids to nature and teach them the benefits of growing our own food. You might begin by watching this series of short film clips on how to start a garden. Some other good internet sources include Kitchen Gardeners International, Revive the Victory Garden and Vegetable Gardener. 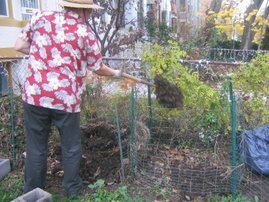 There are also several worthwhile gardening forums at Garden Web where you can pose questions to other gardeners who are only to glad to help. I've also asked some of my fellow food gardening bloggers to share their thoughts on starting a new garden. Take a look at what Sylvie's doing at Rappahanock Cook & Kitch Gardener, or El at Fast Grow the Weeds, Emily at Eat Close to Home, or Michele at Garden Rant. There are also many excellent books on the market for gardeners of all levels. In fact, your local librarian may be one of your best sources on the subject. And by all means take a look around your neighborhood for the gardener who quietly grows prize-winning tomatoes. She'll gladly talk your ear off if you introduce yourself. And even if you can't get a plot at the local community garden this year, there's nothing to say you can't hang out there and ask questions. And for all you established kitchen gardeners and urban farmers and homesteaders with blogs, write up your thoughts on starting a garden and send me an e-mail with a link. I post all the links here for the next week. 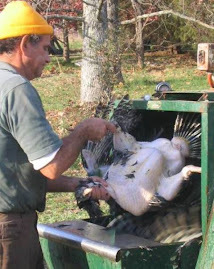 Read more great stories about how were are taking back our food system at Fight Back Fridays. The Slow Cook is expecting to be featured in an article about vegetable gardening in People magazine scheduled to hit news stands tomorrow, April 10. 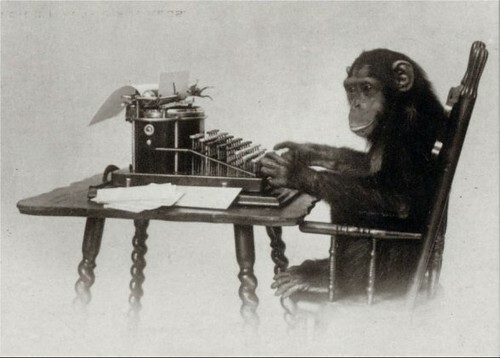 We've been told to brace for a flood of visitors to this blog. Hence, beginning tomorrow, and perhaps for several days, we will be displaying prominently a post on resources for vegetable gardening in the interest of giving novice or first-time gardeners a bit of guidance in starting their own gardens. As soon as the flood ebbs, we will resume our usual schedule of random musings about food, gardening and the pursuit of a sane agriculture policy in these United State. Also of note: We have redesigned the blog and are in the process of transferring it completely to a website in Wordpress. Please excuse any technical irregularities that may crop up in the interim. We hope to have everything under control by tomorrow. In fact, theSlowCook.com is moving from its old home at http://www.theslowcook.blogspot.com/ to its sparkly new home at http://www.theslowcook.com/. Because the transformation is making its way from third-party hosting (blogspot) to a server, you may need to re-register to make comments. We appreciate your patience and are happy to entertain any feedback or suggestions you might have. We couldn't very well have a food appreciation class without something to snack on. 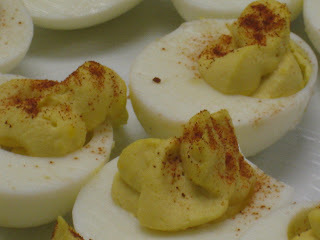 So while our Salvadoran curtido is curing, the kids made these deviled eggs. Actually, I hardboiled the eggs ahead of time in the manner described in our earlier post. Then the kids peeled the eggs and we whipped 1 dozen yolks with 1/4 cup mayonnaise, 1 tablespoon Dijon mustard and 1/2 teaspoon salt. To finish the eggs, we spooned our finshed yolk mix into a plastic storage bag, cut off the tip of one corner and squeezed the mix into the whites. The plastic bag makes a very efficient pastry sack. Simply dust with a little paprika. 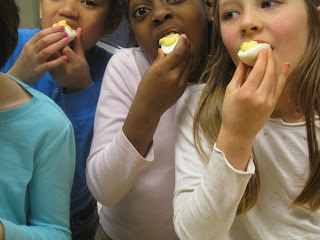 Can I just say, kids love deviled eggs. When we recently made Salvadoran pupusas with the kids in my food appreciation classes my wife's immediate reaction was, Where's the slaw. What she was referring to was the cabbage and vegetable melange called curtido that inevitably accompanies Salvadorn fare. Well, we didn't have time in a one-hour class to make the pupusas and the curtido, so we made it this week. And the thing of it is, the slaw is supposed to marinate in its brine for a week, so it's not something you can just whip together and put on the table. The recipe is simple enough: chop 1/2 head cabbage and blanch in boiling water for 1 minute, then drain. Mix the cabbage with 2 carrots, peeled and grated, 1 small onion, diced, 1 red pepper, diced, 1/2 teaspoon oregano. For the vinaigrette, mix 1 teaspoon extra-virgin olive oil, 1 teaspoon salt, 1 teaspoon brown sugar, 1/4 cup vinegar and 1/2 cup water. Toss everything together, cover and refrigerate for 1 week, stirring occasionally. 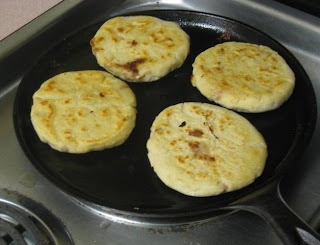 Serve with pupusas or other rustic Hispanic savories.. It's true that older eggs are easier to peel when they've been hardboiled. It's also true that you don't have to wait for your eggs to get old to remove the peels without destroying the eggs. I use Julia Child's method of alternately heating and chilling the eggs. Here's how it works. For a dozen eggs, choose the best you can find, preferably pasture-raised eggs. Place them at the bottom of a large, heavy pot and cover with 3 1/2 quarts cold water. Bring the pot to a boil. As soon as it begins to boil, remove the pot and allow the eggs to sit, covered, for exactly 17 minutes. When the 17 minutes have elapsed, carefully remove the eggs to a large bowl of iced water (you may want to buy a bag of ice for this). 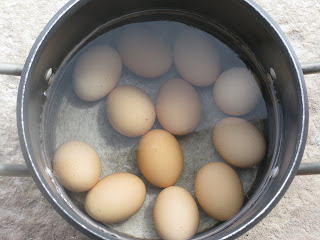 Allow the eggs to sit in the iced water for 2 minutes. Meanwhile, put the pot on the stove and bring the water back to a boil. (Remove the eggs from the iced water after the 2 minutes are up.) In batches of 6, return the eggs to the boiling water for 10 seconds only. Then remove again and place back in the iced water. Crack each egg in several places (or not, if you are planning to decorate them for Easter) and let the eggs rest in the iced water until well chilled. Your eggs are now ready for peeling. I must be terribly old-fashioned because I do not have a computer program to plan my garden. Planning? Mostly I look at what's in my bag of seed packets, look at the garden, look at the seed packets and start digging. My basic tools are some thin bamboo poles for dividing the beds into squares, a tape measure and a spiral bound book where I record what I have done. I've gotten pretty good at planting freehand, meaning moving my bamboo poles to create fairly precise little areas in which to plant a few radishes, say, or carrots or an area of several different varieties of lettuces. 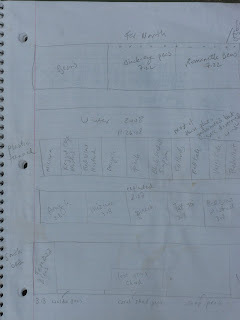 Not far away is my book where I sketch out the bed with pencil, then make notations on what is planted in the squares and the date it was planted. I've never had to buy labels for my garden beds. Whenever I need to remember what I've planted, I just pull out the book. It also works as an excellent log. If I need to know planting dates, for instance, the book tells me instantly. I can also make notes on how long things took to germinate, which varieties did well and which didn't. I'm not sure this would be so simple on the computer. But maybe there are some laptop gardeners out there who know better. How do you keep your garden records? Feeling pressure from a coalition of shareholders, McDonald's has announced that it will examine the use of pesticides on the potatoes it purchases with an eye toward possibly reducing the use of noxious chemicals and making public information about the extent to which its potatoes are sprayed. • communicate findings related to best practices to shareholders, as well as in the company’s annual corporate social responsibility report. The three investor groups teamed with Investor Environmental Health Network to engage McDonald’s in talks about pesticide reduction. The shareholders said the company’s commitment will support progress on the pesticide issues that affect the environment, public health, and farm employees. We say this is a good thing. A spud without chemicals is definitely a better spud. And we like the idea of shareholders mobilizing for food free of pesticides. Excuse me while I gush over my fava beans. 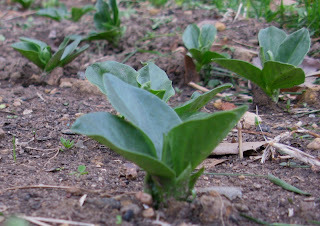 They are one of the first plants to emerge in the spring and they also happen to be one of the most interesting. As they grow, favas assume an architectural yet almost prehistoric looking structure. You would hardly know they were a bean. Yet these are the original beans of the Old World, the so-called broad bean. We love to smash them with peas and Romano cheese and smear them on bruschetta. The peas are coming up. There's a long row of them in a bed where I plan to plant mostly beans this year. As they get taller, I will drive wooden stakes into the ground and tie string to give the peas something to hang on to with their little tendrils. The leaf lettuces have all germinated, along with the radishes and all of our brassica greens: arugula, mizuna, tat soi and mustard. We are seeing the first signs of the new Swiss Chard as well as beets. Carrots take long time to germinate and we are still waiting to see the parsnips and burdock emerge. Some weeks ago I planted seed trays with four heirloom varieties of tomatoes: Cherokee Purple, Mortgage Lifter, Dr. Carolyn (a golden cherry tomato) and Roma. They've already been moved into larger pots and are towering over the bell peppers and eggplants. We have a few broccoli plants and kohlrabi, as well as many little parsley, cilantro, dill and chervil. They will be strategically placed in the garden so that we have a steady supply of fresh herbs. The cilantro will bolt quickly, of course. That's one herb that doesn't take very well to our hot summers here in the District of Columbia and needs to be planted repeatedly. And for the first time we've planted onions from seeds. In the past, we always started our onions from small sets, but they never seemed to get very large. Every day lately I've been carrying the trays of onion plants outside for sun, but it's been a cool and often dreary spring this year. (Great for the spinach, another favorite that's quick to bolt in the heat.) We've seen frequent rain and wind. We should be transplanting the onions soon. This is one of those traditional times when the garden isn't yielding much in the way of ingredients for our kitchen. But there is great hope and lots to keep an eye on. Meanwhile, we are still eating last year's pickles. Last year I began trading some of the produce we grow in our kitchen garden here in the District of Columbia for venison a neighbor harvests on a family farm in Virginia. So far we had received two large packages of venison stew meat and some tenderloin. My last gift to them was a box full of pickles and preserves, a sampling of the many jars we had left over from the summer. The neighbors said they were enjoying the pickles and hinted that more venison was on the way, this time in the form of some sausages. "It's being processed now," they said. Then one night a figure appeared at the store carrying a strange looking load. I turned on the porch light and had a long, frozen package thrust in my direction. 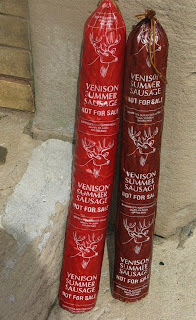 When I unwrapped it, this is what I found: two 20-inch long venison summer sausages, the biggest sausages I've ever seen. Truthfully, I wasn't expecting much from this sausage. As you can see from the label, it was processed for private consumption only. There are big letters indicating "Not For Sale." I thought it would be dry and tasting of who knows what. But that just shows you how little I know about venison sausage. This summer sausage is some of the best stuff I've ever tasted, moist and meaty and--how to say this--barely distinguishable from the finest beef sausage. That leaves just one question: what to do with two 20-inch long sausages? I decided we should start eating some immediately, put some away in the freezer and share the rest with friends. So after the sausage defrosted, I cut it into portions. And began eating...I think I have a new favorite high-protein snack. Meanwhile, the neighbors will be getting two fine tomato plants. 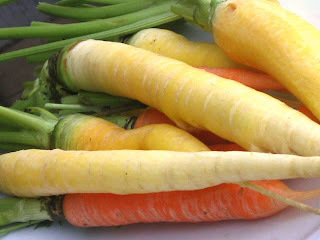 We are growing them now and soon will be planting them in the garden. They'll be able to come by any time and pick what they like. Does that sound like a fair trade to you? Suddenly it's raining every day. Too wet to plant things outdoors. 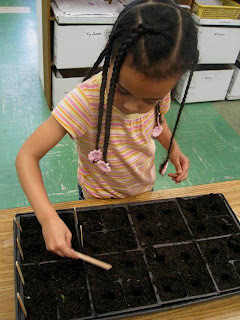 But a perfect time to get things started in seed trays in the classroom. I read three times a week to one of the classes at my daughter's charter school and in spring our attention turns to the garden. 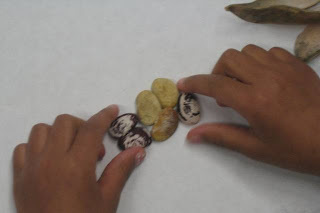 Sprouting seeds is always a fascinating activity for the kids. So I brought a bag of last year's bean pods and had the kids open them to see what's inside. Even Kindergartners catch on fast. I didn't have to show them how to pry the seed pods open. As you can see, we have two different kinds of pole beans. If all goes well, they'll soon be climbing the chain link fence that surrounds the school's sprawling container garden. I simply filled the seed cells with soil from the garden. It's mostly compost, very loose. Everyone planted two seeds along with a craft stick with her name on it. We also planted a few leftover cells for good measure and created a special germination exhibit, hiding some seeds in damp paper towel. We'll check on them occasionally so we can watch the plant emerge. Kids love to mess with seeds. Our "food appreciation" classes arrived in El Salvador on our virtual world food tour and there's nothing more typical on a menu in El Salvador than pupusas. Pupusas are like thick pancakes filled with any combination of meat, vegetables and cheese and like just about everything else in this part of the world they start with corn meal. 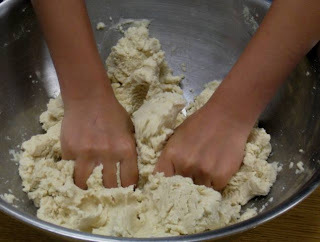 To make dough for 15 or more pupusas, mix 3 cups Maseca or other prepared corn meal with 2 2/3 cups water. (This corn meal, the Hispanic version of Bisquick, has been "nixtamalized," meaning the corn was first soaked in a solution of water and lime or lye. It's widely available in Latin groceries.) When the water is fully incorporated, use your hands to continue the process. 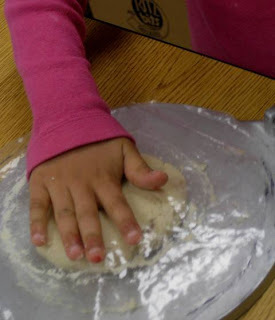 The dough should be spongy but not rubbery, moist but not sticky. 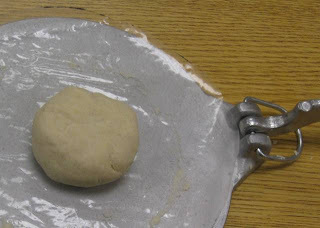 Shape the dough into a big ball and knead it vigorously on a flat surface for a minute or two. Then wrap the ball in plastic and refrigerate for an hour or more, but not more than 24 hours. Pull off pieces of dough and shape them into rounds a little bigger than a golf ball, depending on how large you want your pupusas to be. 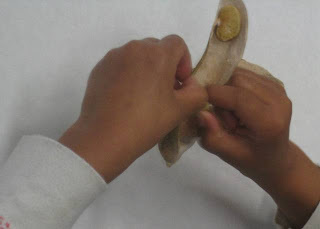 In El Salvador, you'll hear a familiar "pat, pat, pat" as grandma flips the dough from one hand to another, flattening it into a perfect round. But we're new at this, so we used our tortilla press. Don't press too hard! You want your round to be about 1/4-inch thick. 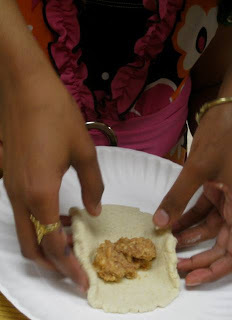 Next, lay a spoonful of your filling in the middle of the round. We made a simple filling of refried beans and mozzarella cheese. What we call "refried" beans actually translates as "well-fried" in Spanish. You can make them yourself mashing cooked pinto beans with lard in a skillet over moderate heat. Canned refried beans also work. We mixed 1 cup fresh mozzarella with a 28-ounce can of beans. 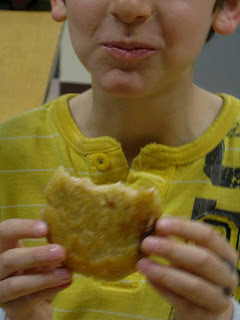 Now carefully fold the edges of the round over the filling and smooth out all the rough edges. Gently mold the package into a ball. 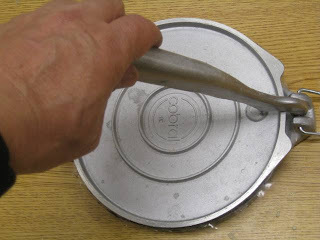 The object is to flatten your package into a pancake shape without creating any cracks or squeezing out the filling. 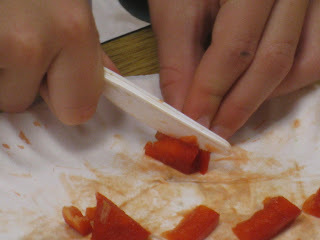 Place it under a layer of plastic and gently press into shape. Now you are ready to cook your pupusas. Any moderately hot griddle will do. We used our Mexican comal, a flat iron skillet covered with just enough extra-virgin olive oil to coat both sides of the pupusas. Fry on each side until golden. Now for the best part. At the many Salvadoran restaurants here in the District of Columbia, pupusas are typically served with a traditional cabbage and vegetable slaw called "curtido." But nobody says you can't eat them just like this. You can read other great stories about how we are taking back our food system at Fight Back Fridays. Our friend Sylvie at Rappahannock Cook & Kitchen Gardener inspired a trip to the health food store to look for a better brand of yogurt culture. I wasn't expecting any more than what I usually see at Whole Foods. Imagine my surprise. 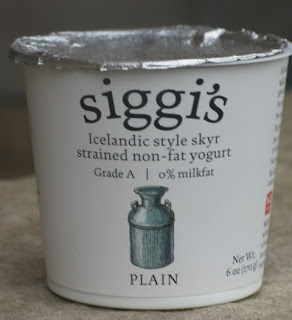 In fact, there were several appealing yogurts I had never seen before, including this one called "siggi's," made in New York State but billing itself as an "Icelandic style" yogurt or "skyr." Of all the yogurts in the dairy case it boasted the largest selection of active cultures: Acidophilus, Delbrueckii Bulgaricus, Delbrueckii Lactis and Thermophilus. Don't ask me what all of it means. Microbiology was not by best subject in college. I just wanted something more than the usual. The way I've been making yogurt for the past several months is to add some of last week's yogurt to a pot of whole, unhomogenized creamtop milk, provided by grass-fed cows and delivered to our door by South Mountain Creamery in Western Maryland. The original culture for this yogurt came from a quart of Seven Stars Farm yogurt purchased at Whole Foods. Seven Stars, a biodynamic, organic operation located in Phoenixville, Pennsylvania, makes a wonderful yogurt. But I was itching for something a little different. The "skyr" has an additional depth of flavor. I can't put my finger on it exactly, but there's something about the tang that hints just a wee bit at a barnyard--in a pleasant sort of way. In addition, I planned on adding whole cream to this next batch of yogurt. Because we haven't ordered any cream for some time, and because my wife hoards the half-and-half for her coffee, I've been making yogurt with milk only and the result has been thinner, with more curdles. My wife insisted the curdles were a result of my overcooking the yogurt. But I knew better. I was convinced that re-establishing the cream in my formula would return us to thick, rich yogurt. Can I take a moment to gloat? I mixed 3 1/4 cups creamtop milk with 1/2 cup heavy cream in a heavy sauce pan and brought it slowly up to 195 degrees over gentle heat. That takes about an hour. I then monitored the pot very closely and kept the mix around that temperature for about 15 minutes. After removing the pot from the heat, I partially filled the kitchen sink with cold water and placed the pot in it, stirring the milk until the temperature dropped to 120. At that point I mixed in 1 tablespoon of last week's yogurt and 1 tablespoon of "skyr." I then poured the mix into a warm quart canning jar and placed it along with two other canning jars filled with hot water in a small cooler. There the yogurt sat overnight, giving the bacteria plenty of time and a cozy, warm nest in which to get busy. I showed the finished yogurt to my wife the next morning and she was convinced. It was the thickest, creamiest, tastiest yogurt we have ever made. I don't see much room for improvement, and I consider the $3 I spent on that 6-ounce container of "skyr" a valuable investment. 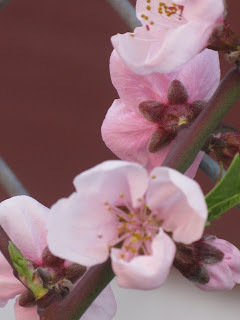 The little peach tree we planted last year at my daughter's charter school is beginning to bloom. Exquisite.